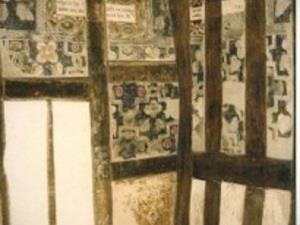 16th Century Painted Room01531 632306work MuseumWhat a treat to uncover the 16th Century Painted Room! At the bottom end of Church Lane, stands one of Ledbury’s oldest timber framed buildings, currently used as the Town Council Offices. It is believed to date from the end of the 15th Century, so stood in need of major restoration by the late 20th Century and work started in 1988. When they got to one of the upstairs rooms, the restoration builders began to strip off the layers of wallpaper and paint that covered the walls. As they did so, one of them noticed an unusual painted decoration apparently painted directly onto the plaster, underneath all the other coverings. Immediately recognising that this could be a significant find, possibly dating back several hundred years, the work was halted. English Heritage was called in and on their advice a team of restoration experts was employed to carefully remove the remaining layers. It took about 4 months to complete the task, but as the layers came off it became increasingly clear that the paintings were far more extensive than had initially been realised. They have proved to be one of the best examples of Elizabethan Wall Painting as yet discovered. The main pattern designs in 16th Century Painted Room are floral and based on the Elizabethan Knot Gardens. Around the top part of the walls there is a valance effect which has boxes containing biblical text. From the High Street, Ledbury, approach the 17th century market house. At the rear of the building you will find Church Lane (cobbled and pedestrianised). The painted room entrance door is the first on the left.